Herbs, annual, cespitose or single-stemmed. Culms trigonous, easily compressed, 30-75 cm × 1-5 mm, basally soft, glabrous. Leaves 1-3, usually withered at anthesis, V-shaped, 5-35 cm × 2-8 mm. Inflorescences: spikes loosely ovoid, 5-25 × 8-22 mm; rays (3-)5-11, 0.4-20 cm; 2d order rays occasionally present, 5-28 mm; bracts 3-7, horizontal to ascending at 30°, (2-)8-35 cm × (1-)4-10 mm. Spikelets 6-60, linear to lanceoloid, 7-30 × 2-3 mm, margins appearing serrate; floral scales 6-24, loosely overlapping, light brown to reddish brown, with conspicuous clear border, medially greenish, 5-7-ribbed, ovate-obovate, (1.4-)1.7-2.3 × 1.4-2 mm, apex acute to obtuse. Flowers: stamens 2-3; anthers 0.4 mm, connective apex reddish, to 0.1 mm; styles 0.1-0.3 mm; stigmas 0.7-1.5 mm. Achenes jet black to dark reddish brown, sessile, obovoid, broadly rounded, 1.2-1.6 × 0.6-1.1 mm, surfaces minutely punctate. Fruiting summer-early fall. Emergent shorelines, roadsides ditches, marshes; 0-200 m; introduced; Ala., Ariz., Fla., Ga., Ky., La., Miss., Mo., N.Mex., N.C., Pa., S.C., Tex., Va.; Mexico; Central America; South America; Asia; Africa. 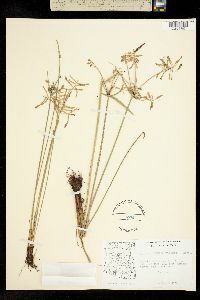 Cyperus flavicomus has long been called C. albomarginatus (see G. C. Tucker 1994). The closely related (perhaps not distinct) C. macrostachyos Lamarck, a pantropical subspecies, has been reported from Central America; the relationship of the two species needs further study. 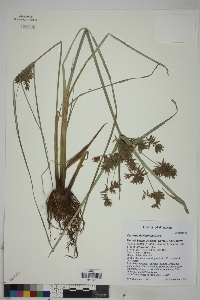 Cyperus flavicomus has been introduced in New York; it has not persisted there (R. S. Mitchell and G. C. Tucker 1997).